*Both monitors must be set to portrait if using dual monitors, will crash if not. Wow when did this happen? 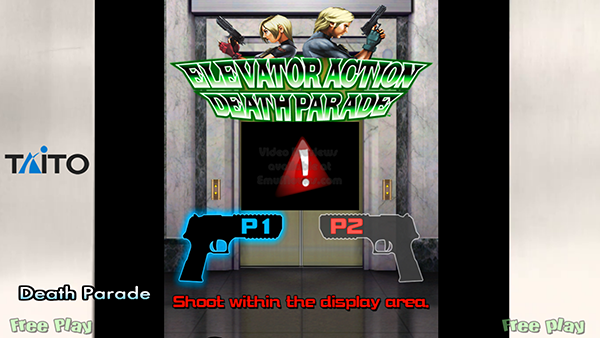 Ive been wantin to play that game, cause I always liked Elevator Action Returns. Il n’est sorti que sur type X2. et la différence avec l'ancien dump qui ne fonctionnait pas ? and the difference with the old dump that did not work? Thats a Raw Game, Not Decypted Game, Hence why you get no game files. Do they have the Japanese audio in the files? Oui Cockmobile est le posteur original sur 1cc. Fixed Tatio logo, Cleaned up doors, Slowed down doors animation, added going up elevater action to the main graphic. Added video tv animation. que je sois en mode portrait ou paysage, fenétré ou non. Quelqu'un a eu le soucis ? There's a folder called vc_J, make a copy of both vc_E and vc_J first and then delete the vc_E file and rename the copied vc_J folder into vc_E so that you can play this game in Japanese audio with English subs while the setting is in USA region on JConfig. The english dubbing for this game is terribly bad! During the cutscenes the screen turns black. Otherwise the game works just fine. Any fix for this? You should go watch a youtube video of the game at an arcade and you'll understand why. does video card have to be nvidia?.. I crash as soon as the Elevator Action loading screen comes up. Has anyone managed to configure their Xbox controller and can share their config (monitor_input.dll & monitor_misc.dll) please? I have my Xbox 1s Bluetooth controller connected with no issues. Not sure if my files will help, but here you go. Try restarting ur pc, and re setting up the game from scratch. I actually kinda had the same problem with my 2nd computer. i have the same problem with ERRO DIRECT3D!" any sugestion ? I followed all the mentioned guidelines but it has a black screen, and the message the program is not responding! 1 - Has anyone managed to run on windows 10? 2 - Has anyone been able to run full screen? is this game playable in win 10, with amd GPU ? tried lots of settings variations and different downloads but all the same outcome. the bugfix for jconfig is it still needed or is jconfigea 1.3 special edition for elevator action the fixed version ? cheers for the info, downloaded latest jconfig but still crashing on game loading screen, tried with game.exe and gameloader all the same outcome. is there something i must do to make it work ?